I've often heard that the best ideas for a story come from real life. That was certainly my experience in writing my time travel romance trilogy, Moonseed. My heroine first came to me when I was on holiday in beautiful California wine country and going through a particularly painful time in my life. Victoria materialized in my imagination already fully formed. The first thoughts she shared with me told of her longing to escape her meaningless life and to find love and purpose and belonging. Intrigued, I began to follow her into a story that troubled me, challenged me, and ultimately gratified me as she found answers and solutions to problems that we both shared. Of course, I had the fun of providing her with all the elements that personally satisfy me most in a story: romantic intrigue with a hero worthy of her, mysteries to be solved, and truths about life to be discovered. I got to visit old San Francisco at the turn of the century and to live the slower paced life of rural California that has always appealed to me. I believe we read to discover ourselves in a character's reflection or to learn something new and interesting about how life works. Although it's true that we can't travel through time to escape our troubles, we can follow a character into her story, adopting her reality and caring about how things turn out for her, and in that imaginary escape discover real relief and pleasure and satisfaction for ourselves. Hidden letters reveal the story of other moonseed, time travelers like herself, and Victoria realizes that she and Katherine will likely be returned to their own times the following spring. Tension mounts when a rich and handsome suitor applies to marry her, and Victoria must choose whether to accept him for Katherine's sake or to follow her own heart. If you could change places with someone for one year, would you prefer to live in the future or the past, or would you stay in the present time, and why? 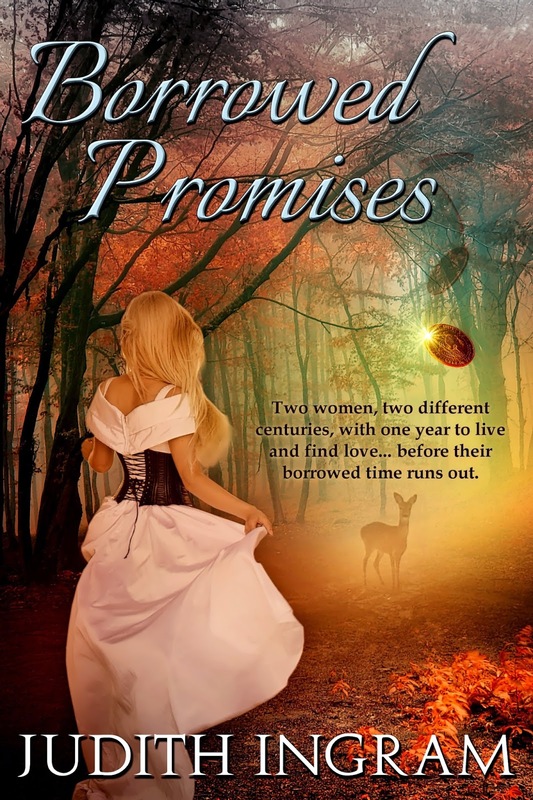 Comment for a chance to win a bundled set of paperbacks: Book One and Book Two of the MOONSEED trilogy: Bridge to the Past and Borrowed Promises. If I could change places with someone for one year, I would prefer to live the past. I would change places with an amazing author wich she was (still is) - Kathleen E. Woodiwiss. I admire her, she has writen such a beautiful stories. To be able to see them in her head and put in on a paper... and give us readers a chance to read breathtaking stories (like all you authors do).... So I would love to be her :) that way I could see what was like to be her and to see what was going on in her head. Thank you for the chance. What a wonderful tribute to Ms. Woodiwiss. I, too, would love to get inside my favorite authors' heads and see what's cooking! Sounds like you're right where you need to be! Nice that we can time travel with fiction characters and never leave our favorite chair. I'd love to spend a year in the past, specifically in an era of which I've always been drawn, which is the court of Henry 111V. I've been drawn inextricably to that era since I was very young- before I knew I have familial connections to the Boleyn's and the Seymores. I'd love to spend a year in the past learning about my Dad's time in the army - not a subject he talked about. Details are important. I hope life will present you with another way to learn what you need to about your Dad. This sounds wonderful! Time travel is so much fun to read about. I would like to go to the past...maybe in the place of a lady in the Ton in Regency London. You are wise to enjoy the present, and I agree--flapper would be fun! I would be more comfortable in the present time, but I don't think I would enjoy the experience at all. I would like to go back in time and be a Prima Ballerina like Anna Pavlova. Now that's a worthy image. I would love to imagine living a life of such artistic grace and beauty.